Length: Select 70" - 77'5" 74" - 81.5" 80" - 87.5"
The Werner Zen 2 piece Adjustable fiberglass stand up paddle comes in two blade sizes (85 & 95) to accomodate all paddlers. The Premium laminate fiberglass construction has a longer more slender blade design which is better for dynamic surfing and turning. 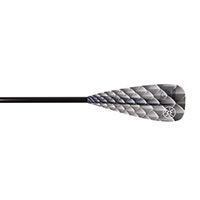 Smaller blades of the Werner Zen are gentle on the joints and allow for a faster cadence. The fiberglass oval index shaft adds comfort, control and is lightweight, stiff and durable. Continuous weave Fiberglass for light swing weight and improved durability. 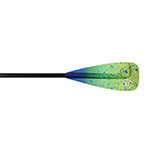 Slight spoon at the tip creates clean catch that is immediately powerful and smooth.